Your iPhone has a lot of important data in it. You have useful contacts, documents, and the pictures you took during your trip are still on the iPhone. One scary question you might not want to think about is “What if I were to lose my iPhone data or lose the iPhone itself?”. Some guy might grab your iPhone on the subway or your kid might format your iPhone. To keep your iPhone data safe, you need to back up your device. This article will show you how to backup iPhone free. 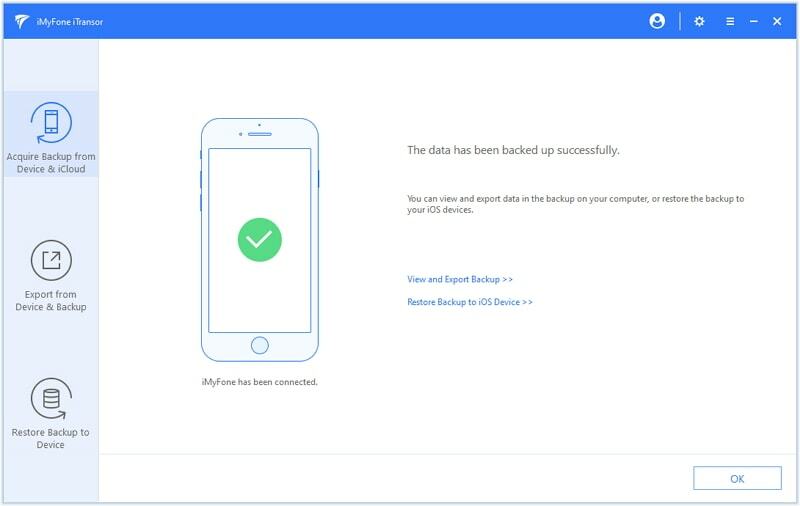 We will even show you a better and more efficient way to back up your iPhone using a free iPhone backup software! Do not believe that they are free? Check below if you think so. Step 1: Launch iTunes on your computer and connect your iOS device using a USB cable. If this is the first time you are connecting the iPhone to the computer, you might be asked for a passcode or to Trust This Computer. Follow the onscreen instructions. Step 2: When your iOS device appears on iTunes, select it. If you wish to save your health and activity data, you will need to encrypt this data. You can do this by selecting the "Encrypt [device] Backup" box. Create a password you can remember. If your data does not require encrypting, just tap Back Up Now. Step 3: Wait for the backup process to end. A "backup finished successfully" message should appear on your Summary screen when the back process is finished. To determine the date and time of the backup, check under Latest Backup. Step 1: Connect your iOS device to a stable Wi-Fi network. Step 2: Launch Settings > tap [your name] > click iCloud. For iOS 10.2 and below, Launch Settings and then tap iCloud. Step 3: Click iCloud Backup. On iOS 10.2 and below, click Backup. Ensure iCloud Backup is toggled on. 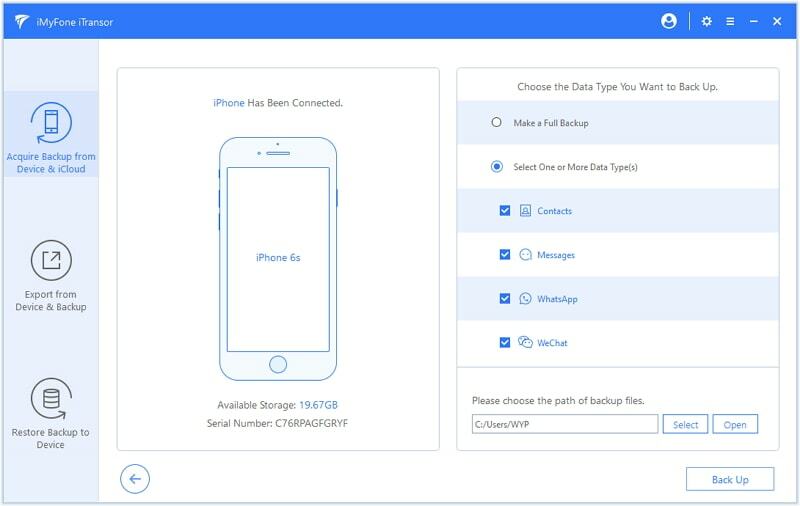 Click Back Up Now and keep your iOS device connected to the Wi-Fi for the backup process to finish. 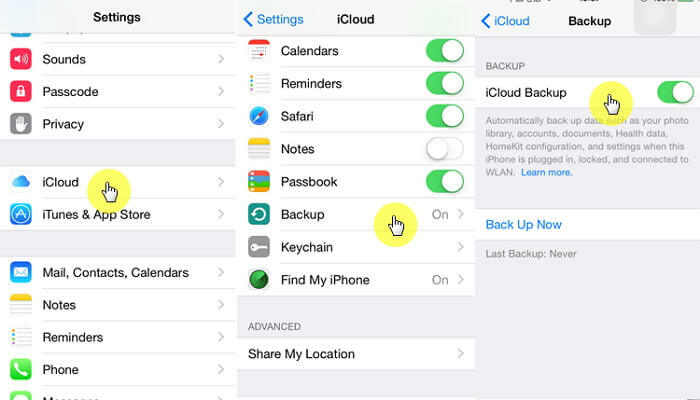 You can check your latest backup by launching Settings > tapping [your name] > clicking iCloud > tapping iCloud Backup. Both iCloud and iTunes are good solutions when you want to backup iPhone free. However, they have too many limitations. To give you a few examples, iCloud only limits you to a mere 5 GB free back up storage. To use this storage on iCloud, you will need a strong internet connection. While iTunes will not require an internet connection, the chances of you losing your data when syncing are extremely high. You can back up and restore your data selectively. You can choose to back up or restore either SMS, Contacts, WeChat, or WhatsApp only. iTransor will allow you to restore your data from iCloud, iTunes and iMyFone backups without any data loss on the target device. You can export and view over 18 data types from both your iOS device and your iTunes or iCloud backups in HTML/XLS format. Step 1: Download and install iTransor on either your Mac or Windows PC. 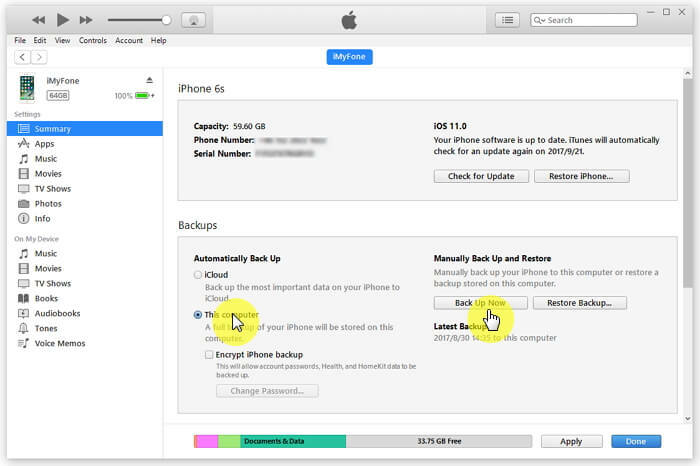 After launching the tool, tap Acquire Backup from Device & iCloud on the Left-hand column. Tap Back Up Device. Step 2: Connect your iOS device to the computer and trust the computer. On the right-hand column, choose either Make a Full Back up or Select One or More Data Type(s). If you choose Select One or More Data Type(s), you will need to tick the data types you wish to back up. iTransor also allows you to choose your backup path. Step 3: Tap Back Up to initiate the backup process. Keep your iOS device connected to the computer until you get notified that the backup process is complete. Step 1: Download and install the app from the App Store. Launch the app and allow it to access your contacts. Step 2: Choose the Backup Contacts option. iMyFone iOS app will scan and display the number of contacts available on your iPhone. Tap Back Up Now. iMyFone iOS app will back up the contacts to a VCF file. Step 3: The app will offer you the option to email your backed-up contacts to keep them safer. You are also allowed to export the VCF to your iCloud account. iTunes will allow you to back up your data without worrying about the backup storage. it does not require an internet connection for it to work. iTunes will not allow you to back up your data selectively. You either back up everything or nothing. Also, when you are restoring your data, the data you have on your iOS device will be overwritten. iCloud will allow you to back up all your iOS devices and restore them from anywhere without the need for a computer. This method has a limited backup storage of only 5 GB. When you exhaust this free storage, you have to pay to upgrade. iCloud requires a strong internet connection for it to work. Just like iTunes, iCloud won’t back up your data selectively. iCloud will also erase your iPhone data during the restoration process. 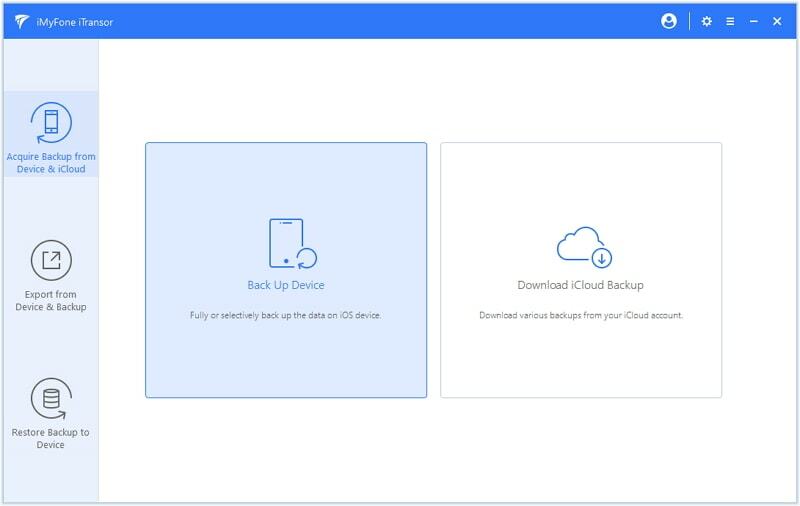 This tool offers both selective backup and restoration. It allows you to preview your data before restoration. Unlike iCloud, iTransor does not limit your backup storage space. Unlike iTunes, iTransor does not limit the number of devices you can use it with. iTransor currently supports iOS devices only. It is quick in backing up contacts. It allows you to merge your contacts. You can find and delete undesired or duplicated contacts. It currently supports contact data type only. The methods we have outlined here will help you back up your iPhone for free. The best method that has no limitations is the use of iTransor. 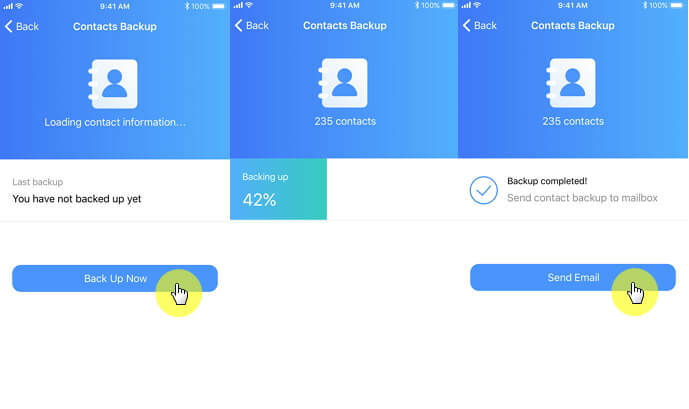 To back up your contacts quickly and with ease, try using iMyFone iOS app. Feel free to leave your comments below.